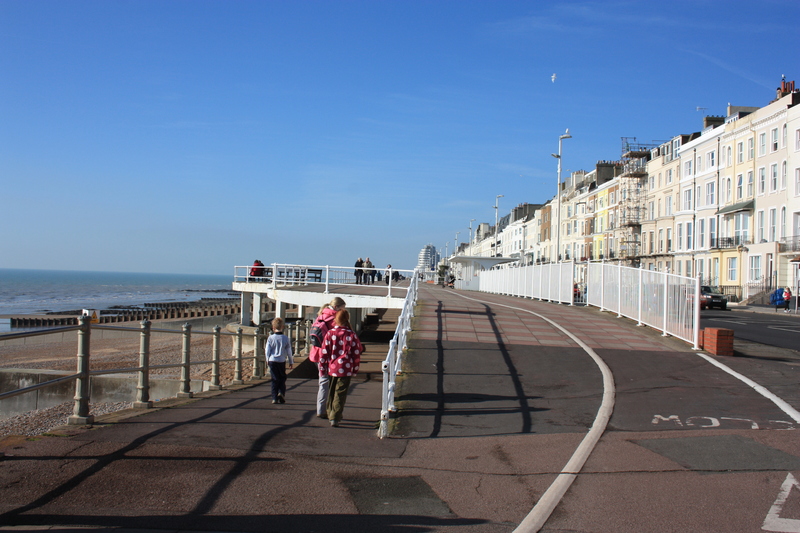 Just after Hastings Pier the beachfront promenade splits into upper and lower levels. The lower level sits exactly underneath the upper, so it has protection in the rain. Our party split: it being sunny, I stayed on the upper level; the others wanted to investigate the lower. The split level promenade ended by Warrior Square, the central gardens of St Leonard’s. As the others emerged from its bowels, a sculpture made out of driftwood caught our eye. Love padlocks were attached to it. We had first come across love padlocks in Cologne, last December, but were not expecting to find them here in St Leonard’s. We were pleased to see them, even if there weren’t too many in number! Love padlocks are traditionally left by amorous couples, who then throw the keys away to signify their eternal love. In Cologne this would be into the Rhine. In St Leonard’s I suppose it would be into the sea (if you ever see a desperate person scrabbling around in the shingle at low tide searching frantically for something, you know they’ve just been dumped). One particular padlock on this sculpture stood out as the largest of the bunch. It was not dedicated to an amorous couple, but rather to Hastings itself. It read, “My heart belongs to Hastings“. 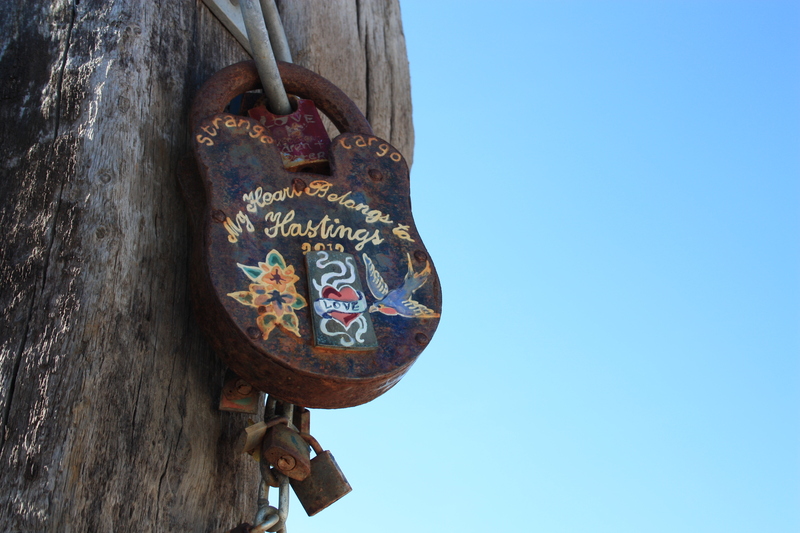 In fact, this padlock is part of the sculpture itself; indeed, the sculpture is called, “My Heart Belongs to Hastings“. It seems that the idea was to create a participatory art form. Members of the public can leave their own padlocks here as fond mementos of their time in, and love for, Hastings, as well as for each other, and for anything else they may feel passionate about. I have to say the concept of this piece does not sit easily with me. Surely love padlocks are not supposed to be placed on pre-designed purpose-built structures? That removes the spontaneity and randomness of love! They are supposed to spring up and flourish in strange places, like love itself. The role of the council bureaucrats who sanctioned this piece of art is to battle to try to get love padlocks removed, and then to lose that battle against a massive backlash of public opinion! Their role is not to guide love towards a specifically pre-designed structure which is officially sanctioned for romantic displays of affection! As much as I like love padlocks, the more I think about the idea behind this sculpture the more I don’t like it. I am sure it looked like a good idea on paper, but I do not think love padlocks should be officially sanctioned. It goes against the very essence of their being. 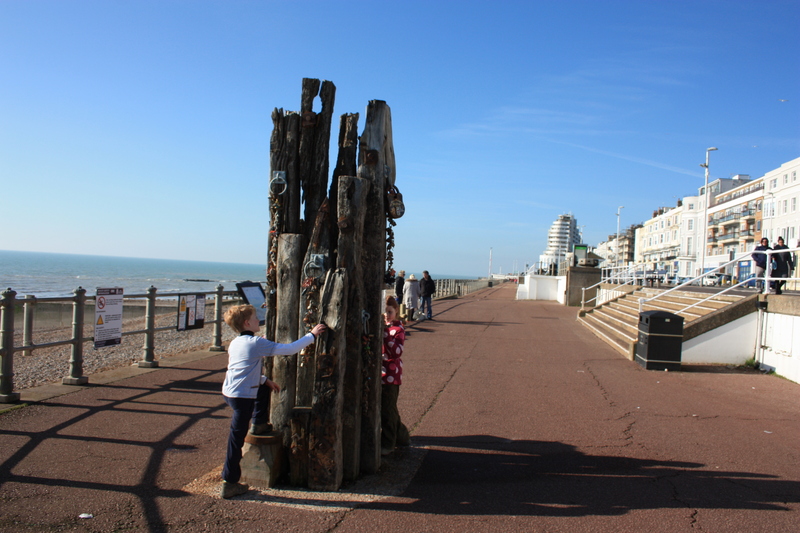 This entry was posted in East Sussex and tagged coast, East Sussex, hastings, love padlocks, sculpture, St Leonard's, travel, walking. Bookmark the permalink.